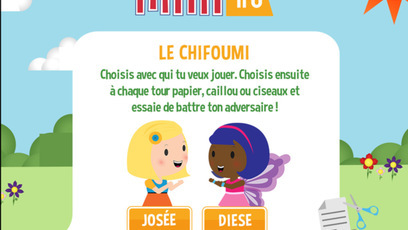 Dièse la fée is also available on Mini TFO A section just for the kids, without ads! Click to explore! Dièse is a music fairy! She loves to sing and share melodies with her friends. Often accompanied by her bird, Dorémi, Dièse has a naturally happy outlook and is full of energy! Dièze the Fairy teaches a series of vocal warm-ups. Today, she´s singing in grand opera style and making her voice vibrate. DORÉMI est une marionnette d'oiseau. DIÈSE est une fée. DORÉMI est sur son arbre. DIÈSE apparaît. DIÈSE s'adresse au public de l'émission. Oh, je ne t'ai pas vu là. de te voir. Tu sais quoi? Oh, et j'ai une idée! Et faire vibrer nos voix. de départ, s'il te plaît? petit solfège. Hi, hi, hi! Dièze the Fairy teaches a series of vocal warm-ups. Today, she´s having a blast singing through her nose. Mini TFO's friends sing along to Mini's theme song. In this clip, it is performed by Dièse, Fleurette and Terro. Dièze the Fairy teaches a series of vocal warm-ups. Today, she has a blast croaking like a toad. Dièze the Fairy teaches a series of vocal warm-ups. Today, she is yawning to relax her vocal cords. Paper, rock, or scissors: beat your competitor by playing one of three possibilities. Scissors beat paper, paper beats rock, and rock beats scissors.